I cannot believe it's the end of February, and time for a look at the things I'm grateful for. Time really does fly by. --I'm grateful for the month of "love". My husband and I have been making a real effort to go on date nights, AND not talk about work the whole time we're out. He's not much of a Valentine's guy, but today he brought me these roses. I have no idea why but I am not complaining. --I'm grateful for the weather. Not trying to make the East Coasters feel bad, but we have honestly had the nicest winter I can remember. February in Seattle is usually pretty miserable - cold, windy, gray and rainy. We may pay for it this spring, but I'm loving the warm-ish, sunny days. --I'm grateful for my new Crock Pot. The last one was round and very old. I got this one for Christmas, and it has many settings and lots more space. There's a whole board devoted to it on my Pinterest page, and I'm always looking for new recipes. I made Creamy Tomato Chicken Pasta last week and it was a huge hit. --I'm grateful for Instagram. It has quickly become my favorite form of social media, and I love seeing everyone's pictures and inspirational quotes every day. If you haven't yet, follow me here. --I'm grateful for these yayhoo's. My son has the nicest group of friends. Every one of them is kind and respectful and they have T's back - always. Luckily they don't normally dress like this or I might have to rethink things. 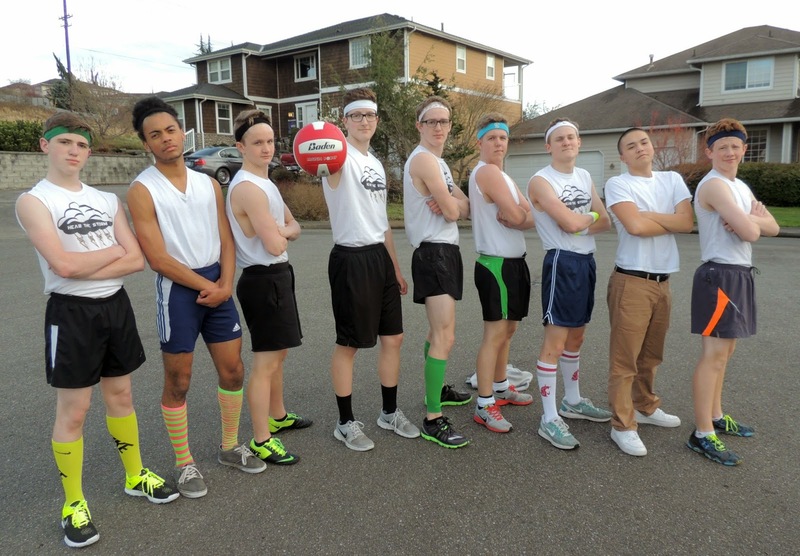 This was their "uniform" for the Macho Volleyball Tournament, a long standing Marysville tradition. I need to get a Fitbit - I've heard so many great things about them. Thank you so much for sharing what you're grateful for - makes me happy to hear it all! bahaha- that picture of the Vballers made me giggle. I agree, instagram is also my favourite right now! Have a great weekend! They're a special group I tell you. And they played as well as they looked - hee hee. A crockpot is a lifesaver! I don't know what I would do during the week without one! I'm checking out your recipe now. I love the photo of your son's friends! Thanks Jill. The Crock Pot is one of the greatest inventions ever. What lovely flowers and I LOVE that crockpot! I just got a new one last year from my daughter at Christmas that matches my new colors so I can't get a new one yet, but I want one of those! I use mine so much and also have a "crockpot board" full of recipes I have found! I haven't tried Instagram yet, but I may soon! I'm getting your posts again so the world is all good! So glad you're getting the posts again. I will go check out your crockpot board for some new ideas! Those roses are beautiful, Lana! And oh, dates with the hubby. I've found it hard to go out with my husband and NOT talk about our son. Any tips? As for your son's group of friends, well, I really think that's something to be grateful for. Knowing that our kids are in good company gives us peace of mind. That's priceless! We have to constantly remind ourselves to not talk about business or the kids. It's a work in progress. I like your crock pot. I love mine too. I'm grateful for my husband that went out to pick up some groceries today and came back with a gift for me (a cute t-shirt). I have that guy trained well. I'm grateful for my pug and that she made it through her surgery and health crisis, even if it did cost close to $6,000. I'm grateful for getting out of this horrible winter and spending a week in Cuba. 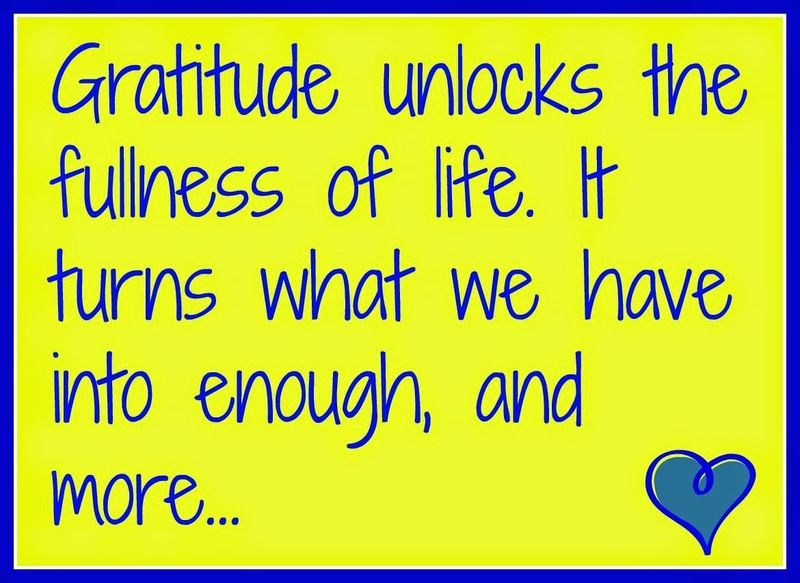 Thank you so much for sharing your grateful list with me! Love it! Your husband seems like such a great man :)! Glad your dog is doing better. 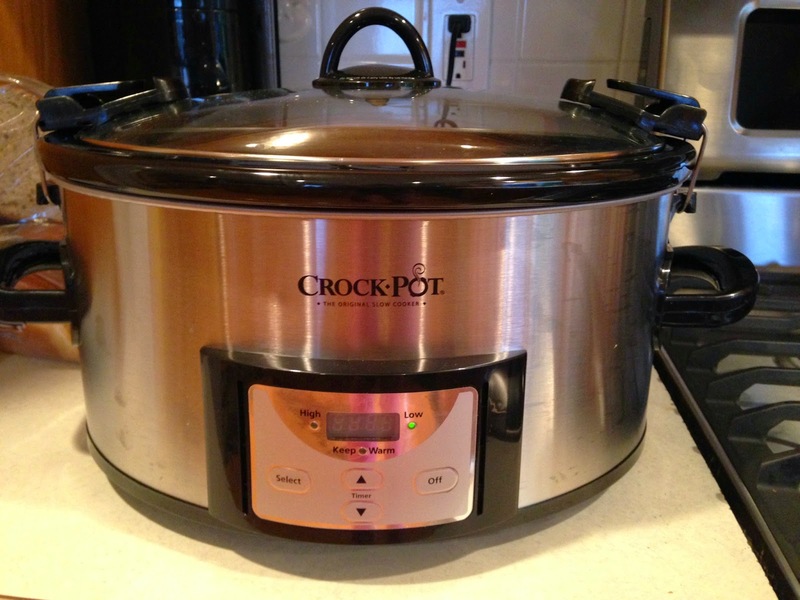 I have this same crockpot and love it. A big upgrade from my old one. Like the that fact that it goes to warm once the timer ends. Enjoy cooking with it. Your roses are lovely. I think getting roses just because is so much better than roses because it is expected for Valentine's Day. What a dainty pink color. Glad you guys are "dating" more. I am hoping to rekindle a little more spontaneity to our marriage. Always a good thing to keep working on the marriage, I think :)! Ah, love the crockpot. 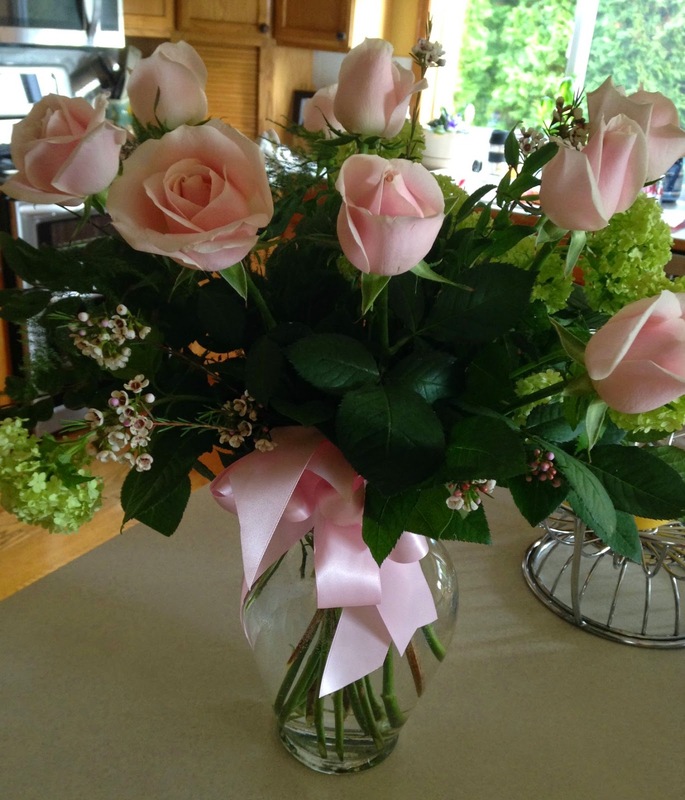 And the gorgeous flowers! I wanted to make an effort to have more dates so I scheduled two in one week with Cassidy. And what happened? Both kids got sick. Ugh! It always seems to work out like that, doesn't it? Hope your kiddos are feeling better and some dates are in your near future! I've loved all your gratitude posts Lana, and I have the same crock pot! I will be trying the Creamy Tomato Chicken Pasta recipe - and I am grateful to once again have Internet and be able to catch up on Instagram and all your your blog posts! I just made the Pasta recipe tonight - and everyone loved it!